Kuhl Wave, under jockey Raul Gutierrez, crosses the finish line ahead of Slew Of Success Sunday afternoon in the Mr Master Bug Stakes at Remington Park. 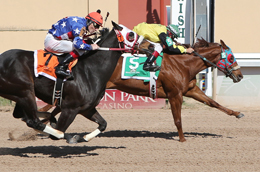 OKLAHOMA CITY, OK�APRIL 21, 2013�Oklahoma-bred 3-year-olds battled 350 yards at Remington Park in Sunday�s undercard stake, the $52,500 Mr Master Bug with Kuhl Wave pulling away to a half-length score. Owned by Miguel Banuelos of Wichita, Kan. and trained by Jose Aguilera, Kuhl Wave won his second race of the season and first stakes event. Ridden by Raul Gutierrez, Kuhl Wave crossed the finish in :17.455 seconds with Slew Of Success second and Send A Candy Guy, part of the favored 5-2 wagering entry with Paint The Candy Lane, third. Kuhl Wave left the starting gate at 5-1 odds and paid $13.40 to win, $6.60 to place and $5 to show. Slew Of Success returned $6.60 to place and $4.20 to show. Send A Candy Guy paid $2.80 to show. The win was the third from 13 career starts for Kuhl Wave, a filly by WAVE CARVER from the Shazoom mare Shazooms Doll. The $30,730 winner�s check nearly doubled the career earnings of Kuhl Wave to $62,490. Kuhl Wave was bred in Oklahoma by Tom Bradbury and Marvin Willhite. Completing the field were Bp Cartels Alibi, Blaze Carver, Madresita, Paint The Candy Lane, Cartel Dynasty, Oklahoma Cartel and Last First Kiss. The Mr Master Bug Stakes is named after the 1982 All American Futurity winner from Oklahoma who was a three-time American Quarter Horse Association divisional racing champion and earner of nearly $1.8 million.